The Graduate College is proud to announce that Ms. Tova Samuels graduated with herPhD in chemistry in June 2012, the first Western Michigan University affiliated MI-AGEP student to graduate from the College of Arts and Sciences at WMU since the inception of the program. MI-AGEP stands for Michigan Alliance for Graduate Education and the Professoriate, a National Science Foundation grant program geared toward increasing the number of under-represented students in the Science, Technology, Engineering and Mathematics (STEM) and Social, Behavioral and Economic (SBE) fields. Besides Western Michigan University, other member institutions are Michigan Tech, Michigan State University, University of Michigan and Wayne State University. AGEP students may be supported in their pursuit of doctoral degrees for up to four years. Ms. Samuels’ advisor in the Chemistry Department was Dr. Sherine Obare, whose tireless work on behalf of recruiting and retaining highly qualified students has resulted in a number of AGEP awardees in the Chemistry Department. Ms. Samuels’ specialty in the field of chemistry is nanoscience; her dissertation title is “Strategies for Studying the Interaction of Nanoscale Materials with Chemical and Biological Contaminants.” In this area of specialization, Ms. Samuels primarily studied the interaction of silver, gold, and bimetallic-silver/gold nanoparticles with pesticides, specifically organophosphorus pesticides. These are a particular class of pesticides that are similar in structure to some chemical warfare agents. She also used silver and gold nanoparticles coated with an antibiotic, ampicillin, to study their effects on antibiotic resistant bacteria. 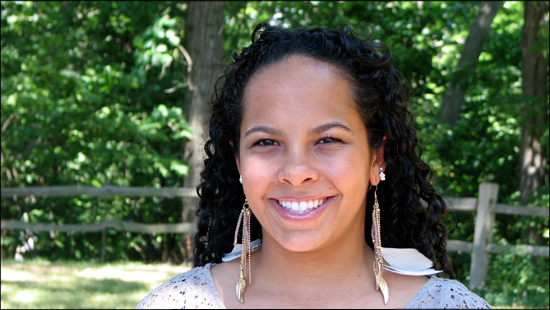 Ms. Samuels received her Bachelor of Science in Chemistry from Cedar Crest College in Allentown, PA, in 2007. She chose Western Michigan University for graduate study on the strength of a recommendation by her advisor. She has earned several scholarships, awards and honors at WMU, including the Gwen Frostic Doctoral Fellowship for Spring 2011, the Graduate College Graduate Travel Fund award, 2010, and the MPI Research, Inc. Graduate Research Scholarship, 2011. When asked about her most outstanding experience at WMU, she said the entire experience of earning her PhD was memorable and life-changing. In five years, she sees herself wearing many hats and serving many positions. She has interests that expand far beyond the classroom, leading her to pursue a career as an educator and a business entrepreneur. Her extra-curricular professional activities include membership in NOBCChE, the National Organization for the Professional Advancement of Black Chemists and Chemical Engineers. She volunteers for the Secondary Education division of NOBCChE and plans to pick up more volunteer opportunities outside of NOBCChE now that she has graduated. She also does free-lance tutoring. Ms. Samuels is interested in promoting an eco-friendly, natural lifestyle and proudly states, “I’m out to change the world!” Given her outgoing personality and her many professional skills, the Graduate College has no doubt that she will do just that and congratulates Ms. Samuels on her achievement in attaining a Ph.D. in Chemistry at WMU. This entry was posted in Graduate Student Achievement by GradStandard. Bookmark the permalink.